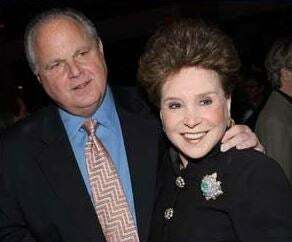 RUSH: So I get a note the other day from my old buddy Cindy Adams at the New York Post. (interruption) I knew that would get Snerdley’s attention. If you’re a New Yorker, the name Cindy Adams makes you perk up for any number of reasons. I first met Cindy Adams shortly after arriving. It was one night at dinner at Patsy’s, and she had her husband with her who did not like me and half the night did not remember who I was. But kept cracking jokes about things, and she kept pooh-poohing. “Just shut up, Joey. Just shut up,” and Joey’d go back to the rigatoni, and she was trying to learn who I am. Joey and the gang at Patsy’s had set it up, and one of the most famous nights I ever had with Cindy Adams was she invited me to be her guest at a private HBO screening of some television movie. I don’t even remember what it was. But it was everybody in the HBO liberal establishment that showed up, and she wanted to walk in with me — and they could not believe it. It was so much fun. I saw Joy Behar, who I hadn’t seen in 20 years, and I went up and gave her a hug, and she reacted like I was Matt Lauer, and she turned around. Anyway, Cindy Adams does something special. You know, she’s a big animal lover. And this Sunday at Christ Church, 60th and Park, at 2 o’clock in the afternoon, she has a prayer day for the animals where, if you want to, you can take your gerbils, you can take your cats, you can take your dogs to this church, and there will be a church service and prayer for the animals. It’s the ninth one of these that Cindy has sponsored. It’s Christ Church, 60th and Park at 2 o’clock in the afternoon. Right now, she has reservations for hundreds. She’s aware that 700 animals with their parents she says will be “jamming the church,” but anybody and everybody is welcome, and she wanted to remind me of this. There will be pigs and llamas and alpacas and — as I say — some will no doubt bring gerbils, dogs, cats, birds, turtles, fish in bowls. It’s the ninth one. She does this because she’s an animal lover and she thinks the animals need to have their own worship service during the holidays. Obviously, it’s for the pet owners, but it’s also for the animals too. In fact, the headline of her piece is about prayers for animals. So Christ Church… Can you imagine the church agreeing to this? So it’s December 3rd, just a couple days away, this weekend. It’s 60th and Park, which is, hey, folks… I mean, 60th and Park? That’s right in the heart of what you would call the elite. (chuckling) It’s one of their churches where this is gonna happen.